Musco Center for the Arts Grand Opening Concert Cast and Chorus. 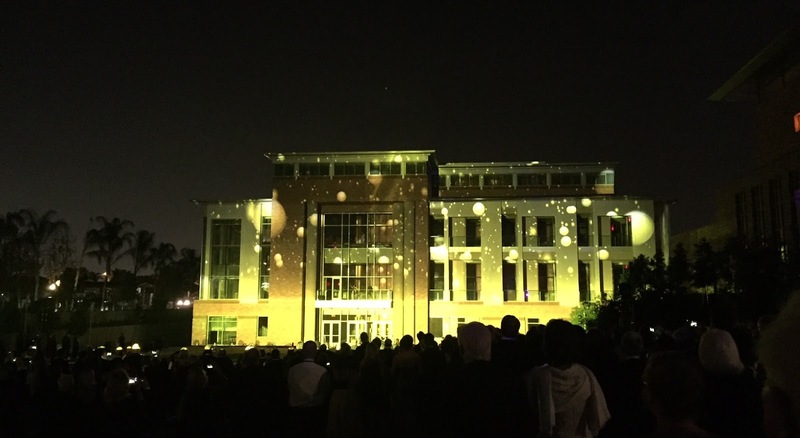 It was indeed an auspicious occasion at Chapman University on Saturday night where over a thousand guests gathered for the much-anticipated official opening of the Marybelle and Sebastian P. Musco Center for the Arts. 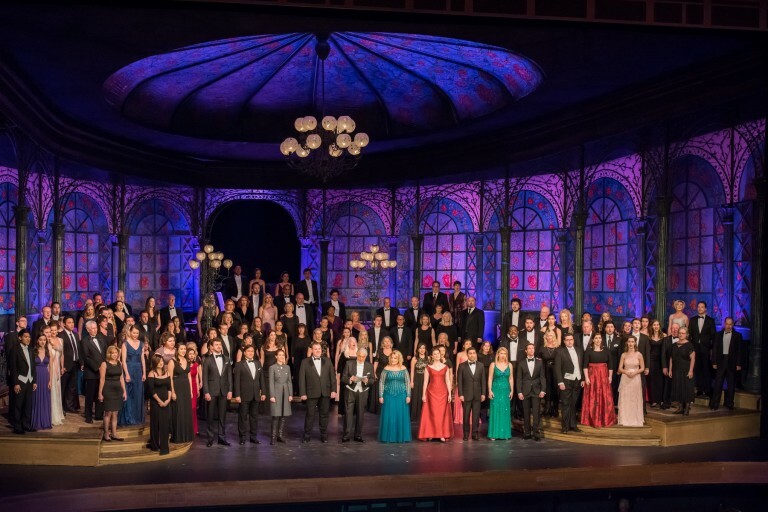 The black tie event featured a concert performance by luminaries of the opera world, including Plácido Domingo, Deborah Voigt, and Milena Kitic, joined by a number of Chapman alumni, the Chapman University Singers, and Alumni Choir. Acclaimed conductor John DeMain had the honor of being the first to conduct an orchestra from Musco’s pit, leading the Los Angeles Opera Orchestra in Leonard Bernstein’s brilliant Overture from Candide. In many ways, it was the perfect choice to open what would be a magnificent program because its fanfare, lush lyrical passages, and delicate rapidly-moving melody lines highlighted the impeccable sophistication of the hall’s acoustics. Every note was crystal clear. 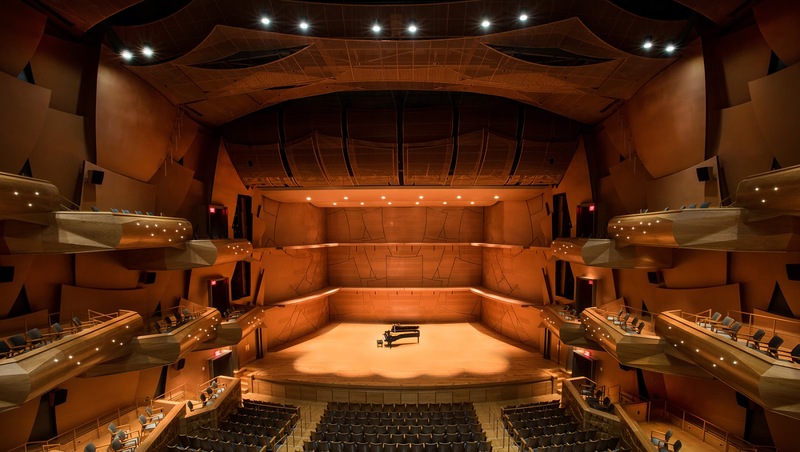 No surprise there, as the man responsible for creating the acoustics is world-renowned acoustician Yasuhisa Toyota of Nagata Acoustics (who also designed the acoustics for Walt Disney Concert Hall, Stanford’s Bing Hall, and the Sydney Opera House). The building and site itself was designed by Pfeiffer Partners and follows the concept of a renaissance garden in both interiors and landscaping. Stunning views from the three-tiered structure overlook the graceful sloping lawn of the Bette and Wylie Aitken Arts Plaza which will also host outdoor productions. It was from this location that guests witnessed a spectacular light show and dedication following the gala concert before being wined and dined for the remainder of the night. But back to the program. As the star of the evening, Mr. Domingo was undeniably charismatic. He led the gala cast and chorus in Verdi’s celebratory drinking song “Libiamo ne’ lieti calici” from La Traviata and then displayed the full richness of his voice in “Di Provenza il mar, il suol.” But it was Agustin Lara’s “Granada” sung in front of the curtain that bears his name that had the audience eating out of his hand. In a meta-theatrical moment, Ms. Voigt (who started her career as a Chapman student) proved utterly charming singing Wagner’s “Dich, teure Halle” from Tannhäuser, her ode to the “dear hall.” Musco’s acoustics facilitate the ring in a soprano’s high notes by picking up the overtones and letting the sound spill out over the audience like champagne bubbles, a result enjoyed by both Voigt and Ms. Kitic, whose rich tone and powerful high notes were exquisite. Kitic’s “O don fatale” from Verdi’s Don Carlo was a favorite of everyone who commented after the concert. Joining Kitic for the “Barcarolle” from The Tales of Hoffman was Chapman alum Deborah Domanski who later returned as Count Orlovsky from Die Fledermaus. To the delight of the audience, the second verse of her aria featured a new comedic lyric in honor of the occasion. Also returning to their alma mater to perform were coloratura Stacey Tappen singing “Glitter and be gay” from Candide; Lincoln Center’s 2016 Emerging Artist of the Year Ben Bliss singing “No puede ser” from Pablo Sorozábal’s La tabernera del Puerto; John Nuzzo with “Nessun dorma” from Puccini’s Turandot; Efraín Solís singing the crowd-pleasing patter song “Largo al factotum” from The Barber of Seville; and Bruce Sledge, whose smooth, lovely tenor voice made “La donna e mobile” from Rigoletto another highlight. The program also included the popular duet from The Pearl Fishers sung by Domingo and Nuzzo, and the quartet from Rigoletto featuring Tappan, Kitic, Sledge and Solis. The full cast and chorus concluded the evening with the finale from Candide, “Make our garden grow,” an appropriate sentiment given the extraordinary efforts that have gone into raising Musco Center and will now continue to grow its future. The celebratory event was an unforgettable evening honoring good people doing great work for the arts and for their community. May there be many who follow their lead. If you’d like to see what the buzz is all about, mark your calendar for Saturday, April 2. 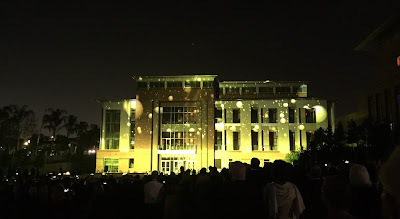 Musco Center for the Arts will host a day-long Community Open House & Arts Festival from 11:00 am to 10:00 pm featuring performances by many local artists, Chapman student ensembles, and Pacific Symphony. Events will include family activities, tours and demonstrations, food trucks, and three internationally acclaimed fusion/world music groups: Troker, Delhi 2 Dublin, and the Stooges Brass Band. For more information about the festival and a complete list of upcoming season events, go to www.muscocenter.com.